The workhorse press at Handset Press is a motorized 8x12 Golding Jobber No. 6. The press is driven by a variable speed motor. William Golding started manufacturing presses in Boston about 1870. His earliest success was with the Pearl, a model still popular with hobby printers. The Jobber, a larger press introduced in 1880, was designed for professionals. The No. 6 Jobber is the smallest size. The serial number indicates it was completed May 31, 1906. At about 600 pounds, it's a substantial piece of machinery, but its 24 inch width allows it to fit through most doorways. The previous owner, Mike Hammerberg, contacted me in early 2000 to ask for help disposing of his print shop. He originally bought the Jobber for $50 from the University of North Dakota Press in 1971. He used it to teach printing for several years at Cooperstown High School, then brought it to California in 1982. 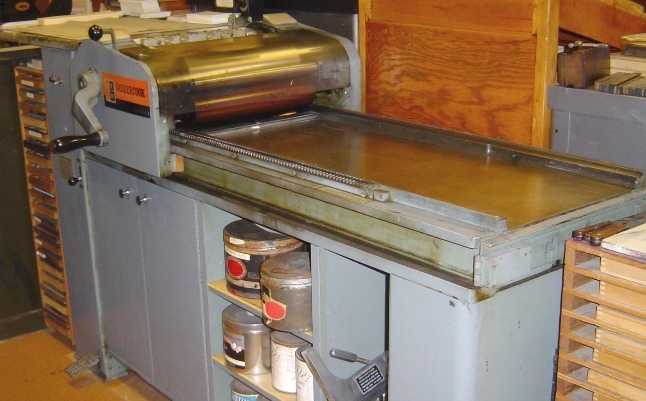 When I purchased Charlie Hinde's printing equipment in 2004, one of the prizes was a Vandercook Universal I cylinder proof press, originally sold to Hillis Printing Co. of San Jose on July 10, 1970. 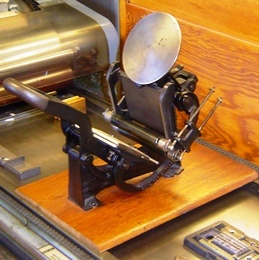 This press is a hand-cranked model, designed to create high quality proofs. 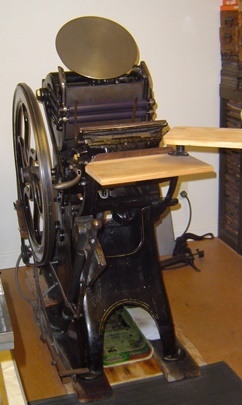 At the end of the letterpress era, but before graphic computers were common, printers would use presses like this to create images for their offset plates. From 1975 until 2000, my only printing press was a hand-powered 6x9 Sigwalt Ideal No. 5. John Sigwalt built his first press in the late 1890s, basing his design on the Golding Official. One difference of the Sigwalt Ideal is the square base rather than the Official's round one. My press was purchased new in 1965 by Leland M. Hawes, Jr., of Tampa, Florida. When I was going to have my print shop shipped to California, Lee offered his Sigwalt since he had not used it much after getting an 8x12 Chandler & Price. The Sigwalt's heavier bed was a nice step up from my Kelsey 5x8. Among Charlie Hinde's equipment was this 3x5 Kelsey Excelsior that is nearly identical to my own first press. The rounded handle identifies it as a post-World War II model. William Kelsey started selling his small presses in 1872, a time when a number of table-top presses first hit the market. Kelsey eventually bought up or drove out of business most of his competitors. The company's ubiquitous "print your own cards" ads, drove the "boy printer" movement and also attracted letterpress hobbyists. The press is only large enough to print several lines of type. But it is just the right size for showing a youngster the basics of printing. It also is easy to take to off-site printing demonstrations.